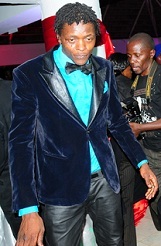 Jose Chameleone also the Leone Island boss signed a five year contract with an online music businessman for only Shs5m for a period of five years and according to insider information, the businessman is already in multi millions courtesy of a song that was sold to a telecom company. The singer is now in consultations with legal experts on how to get out of the deal but it looks like he has to wait until the five years are over based on the contents in the small print. It's not the first time when the star is signing bad contracts. One time he signed up one with a top telecom company and in the process lost millions of shillings as he was not supposed to perform at certain functions.